By Colin Layde | April 30, 2013. Graffiti artist Maser has completed his latest mural outside the Sugar Club on Dublin’s Leeson Street. The piece focuses on the Dublin Lockout, the industrial dispute which engulfed the capital in 1913. 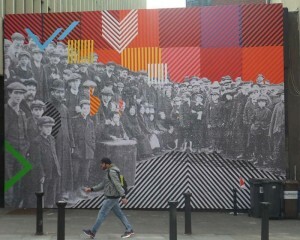 The project saw Maser collaborate with renowned French urban artist JR and pay homage to the city’s working class. This year marks the centenary of the Lockout and the artist felt it was important to pay tribute to the workers who went on strike. “I was aware of the Lockout and I wanted to do something to commemorate Larkin, Connolly and the workers. It’s the anniversary and I felt it was vital it wasn’t forgotten about,” he said. Last year, the artist was commissioned by the Liberties Festival to paint a portrait of Anne Devlin. The mural which is located on the corner of Meath Street and Carman’s Hall, was well received by the community. Anne Devlin acted as a housekeeper for Republican leader Robert Emmet and was forced to endure brutality in Kilmainham Gaol following his failed rebellion of 1803. Emmet was subsequently hung on Thomas Street, while Devlin was forced to live out her life in poverty in the Liberties. The artist says he felt compelled to paint a portrait of Devlin, following a visit to Kilmainham Gaol. “I was in Kilmainham and I came across Anne Devlin. I learnt about her struggle and came out inspired to paint a picture of her,” he says. Amazingly the artist was approached the following day by Festival organisers and asked to paint the mural. 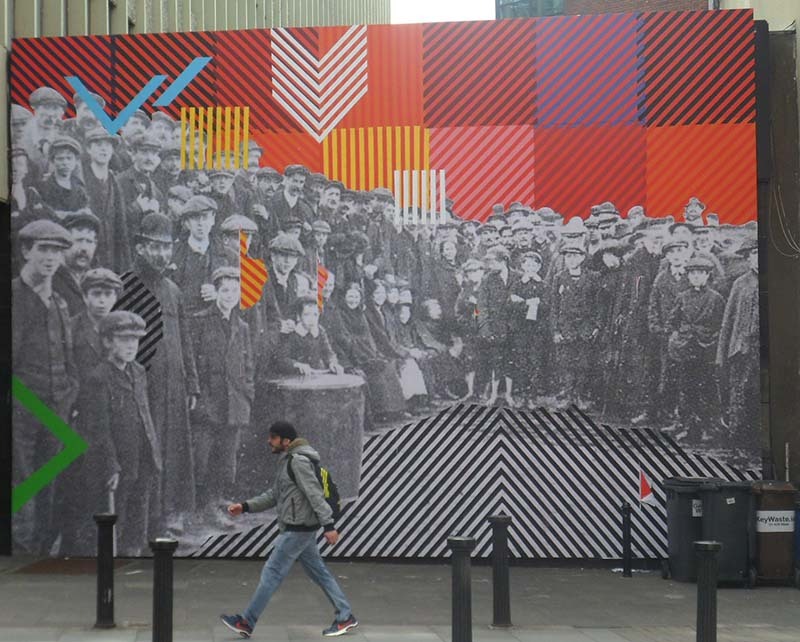 Maser believes that graffiti and street art can help to engage young people with history and the artist attempts to address historical issues in a contemporary fashion. “I had no interest in history as a kid. I paint in pop colours to catch kid’s eyes, so maybe they will investigate further and learn about Anne Devlin or the Lockout,” he says. Maser recently returned to the Liberties to complete another piece, the work was part of the Fortnight Festival which aims to promote awareness of mental health issues in the city. The artist painted a hoarding on Kevin Street advising Dubliners to ‘live and love’.